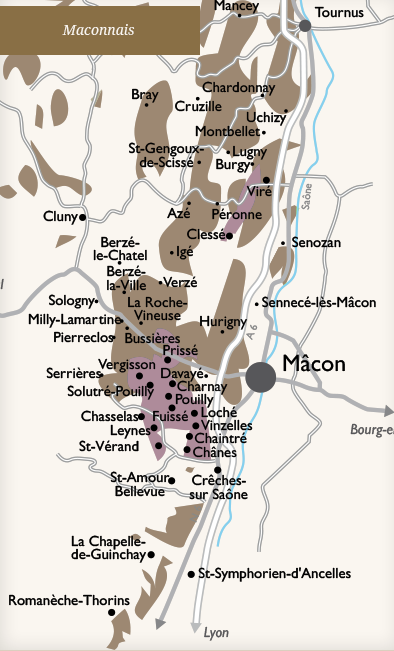 Located in southern Burgundy, this appellation is divided between the villages of Fuissé, Solutré, Pouilly, Vergisson and Chaintré. Soil The vineyards cover the stony, scree-covered slopes and feet of the rocky hills where the soil is composed of Jurassic calcareous clay. The slopes create small cove-like formations with rather steep escarpments that face east and southeast. Vinification Traditional vinification at 20°C in temperature-controlled tanks. The wine is aged on the lees and is stirred while it ages in oak barrels (25 to 30% new oak) for 12 to 14 months. Robe Gorgeous brilliant pale yellow in colour. Nose The nose is light with notes of white blossoms underpinned by hints of vanilla and a touch of smokiness. Serve with This wine may be paired with all types of fish, especially freshwater fish, seafood, and white meats in sauce. Try it with filet of trout with almonds, salmon “en papillote” or stewed veal in cream sauce with baby vegetables. At the end of the meal, enjoy an assortment of goat’s cheeses. Serve at Serve between 10 and 12°C in order to best appreciate all of this wine’s freshness and roundness.